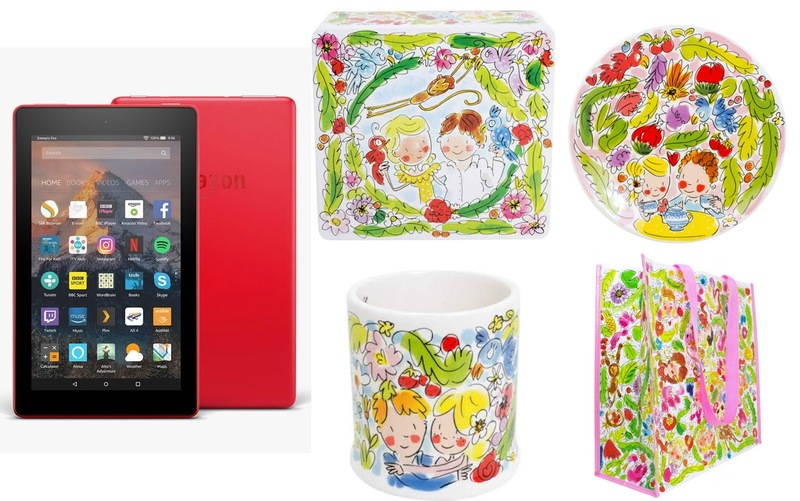 Enter this giveaway for a chance to win a Kindle Fire 7 and a Blond Amsterdam Paradise cookie jar, mug, plate and tote bag set. Good luck! The last thing I celebrated was my dad beating cancer after being given a 10% chance of surviving. We threw him a huge party with family and friends. My last celebration was for my birthday and it was quite luxurious, going to a spa and relaxing. Just recently celebrated my 44th birthday by having sushi for the first time. That was fun. I went to my husband's brother-in-law's 90th birthday party yesterday. He is still an active person and was greeting everyone at the door when they came in. We had punch, cake, pickles, pimento cheese sandwiches, and peanuts to eat. We had a fun time talking to him and several other party goers. My mother's birthday. We went away for the weekend and dined out, went to the casinos, and just enjoyed our time together. My birthday, and me and 5 friends went to play golf at the Belfry, which was a great experience, and I played well as well. Congratulations on 10k likes!!! My nieces birthday! We had a great time and she loved the bluetooth jukebox I gave her! We took friends out to dinner who had had a really tough year on the night they received some long awaited good news. We celebrated my daughter's 18th birthday with a big party with all her friends. My nephew's 4th birthday and we had a superheroes themed party. Our family celebrated our child being on the Dean's List. The last thing I celebrated was my daughter's and my birthdays (one day apart). We got everyone together and bought in dinner and just enjoyed each other's company. Thanksgiving & we celebrated with a big turkey dinner with my sister. My anniversary, we went to see Cavalia. We celebrated Christmas last year with family and it was a lovely family dinner. I recently celebrated my birthday with a party for family and friends. My husband's birthday. We had a special dinner. My sister's birthday this month.Eat Mongolian-style hot pot with my family. Last thing we celebrated was my parents birthday and we celebrated it with a breakfast buffet ! We celebrated my dad's 93rd birthday by taking him to the Half Shell Oyster House. Yesterday it was our local radio station's 25th birthday (Island FM, Guernsey) and they had a little party at a bar from 12 noon til 4pm. I went for a couple of hours to help them celebrate, was nice to chat to the DJ's and fellow listeners. I threw an intimate birthday party for partner and invited his with very close friends as he never celebrated an "extravagant" birthday ever. He was so surprised and really delighted. My 60th birthday; it was celebrated with a surprise party and visit from interstate friends and relatives. Yay! my son's 21st and we had cake!! The last thing I celebrated was an anniversary, we've had a special dinner and cocktails. We last celebrated my niece and nephews birthday at the end of August - we had a party at my parents home and hired a bouncy castle for all the grandkids! My friend's British Citizenship came through so we threw a party for her! We just celebrated my eldest daughter's 8th birthday last September 5, we just had a simple celebration together with our families and love ones. The last thing I celebrated was my birthday. I cut a cake, took photos, enjoyed my favourite dish, received few gifts & celebrated well. A few weeks ago we celebrated my Mum's 60th birthday with 22 of us staying at a caravan site. Loads of fun for everyone. My son's birthday and I went out to eat to a restaurant fast snack food type of place . The last thing I celebrated was my younger sister birthday and I baked her a huge cake. My grandma's birthday! We went out to dinner. We celebrated our third anniversary with my husband at a pub drinking beer. My hubby turned 34. We just had a nice dinner and a homemade cake. My birthday, with a week of celebrations, ending with a gin festival. Celebrated my father in laws 78th birthday, with a family braai. Celebrated my rugby league team getting to the Grand Final by hugging complete strangers when the final whistle blew. Great way to meet new friends lol. But then went to the bar at the ground and had a glass of red wine or two. Both my husband's and my birthdays are at the end of September so we celebrated together by going out to the Keg for dinner. On my wonderful sister! My birthday the family all went out for a meal. Diwali. I lit a candle for Ganesha and wished for world peace! We celebrated my son's birthday by going to a trampoline park and out to dinner! I celebrated my wedding anniversary. I gave my husband a wood pipe and I got a calligraphy set! My husband's 50th birthday in August and we went out for a nice meal with our family to celebrate. My youngest son's birthday in September. He turned twenty seven so we bought him a gift and took him out for a nice meal at the restaurant of his choice. My mom's birthday was in September, we had a fun day together. I celebrated my niece's birthday w/ a family party. My brother had a housewarming party and invited the whole family over. It was last weekend. My nephew's promotion at work, he had a house party with friends and family. My twin boys recently turned 18yrs old! My Birthday. It was a few days ago and I celebrated it wit my family and friends. Nothing big. We celebrated my grandson's 10th birthday just 4 days ago. We celebrated my husband's birthday with a summer cruise! The last thing was my birthday. People that love me threw a surprise party. <3 We had loads of good food, and at least 3 cakes. There were fireworks. It was amazing. The last thing I celebrated was my husbands 53rd birthday in October. We went to a local club and spent the evening with friends. The last thing we celebrated was my sisters birthday and we all went out to eat and gave her presents. Our 15th wedding anniversary and we had a romantic dinner at home. I celebrated my birthday with my friends and sushi! We combined my sister and my birthday this past Sunday, we had a lot of fun with the family. My Daughter's 18th birthday. They are growing up too fast. The sale of my parents house - we threw a big goodbye party! We celebrated by husband's 42nd birthday, but just a quiet takeaway & movie! I celebrated my birthday with my brother and sister in law by going out for lunch and then shopping! I celebrated my granddaughters birthday with her by taking her shopping. The last thing we celebrated was my birthday. My daughter's took me to a Pinot and Pallets class. We painted a picture and laughed a lot. 3 weeks ago we celebrated my little girl (9) donating her hair to the Little Princess trust and raising £500 for a new wig for a boy or a girl. This prize is, actually, on her Christmas list (I would have sent you the photo of it as a proof if there was a camera option :)) and , I would love something wonderful to come Helena's way. I can't think of a better way to celebrate :). My leaving party from my last job. We had a lovely meal and drinks. I celebrated my boyfriends birthday. I made him a steak & potato dinner. The end of the week! I bought some nice food. My sister in laws birthday, with lots of cake! We celebrated my husband's 40th birthday last month with a big family meal. It was my birthday and we feasted! Had all my family and friend share it with me, it was great times. It was my birthday and we had a lovely evening with the little ones, pizza and a film! Entered your contest...hope to win a prize...thanks for the chance. My birthday - I went for a beautiful Italian dinner at a San Carlo!